The automatic creation of product sheets on Amazon. For 2 years the major weakness of the module was that it only did the updates and when a new item was not referenced by Amazon, we had to create it manually in the back office of Amazon; SellerCentral. It now belongs to the past! The module create in a transparent manner the products in Amazon back-office, whether it is a single item or a product accompanied by variations. Profiles and Mapping have been added in order to assign groups of categories in a mask creation which is simple and easy. In Amazon, each profile can indicate the nature of the product and its possible Combinations which are also called Variants at Amazon. It is very simple. When configuring the module will search in real time for classification elements of products on Amazon and propose a chosen mask in the required entry fields. These fields are then used by the module to create records. Save and export your products! What is sent on Amazon? 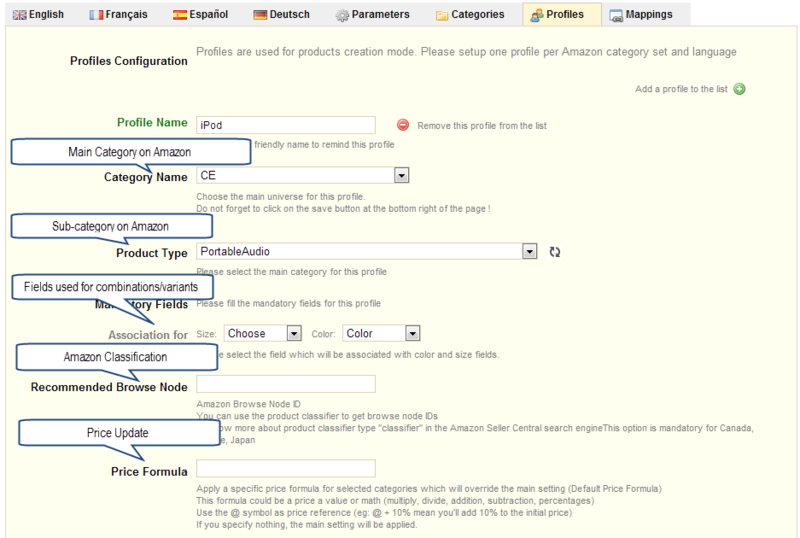 – Required fields imposed by Amazon according to the categories. The cover image and the other images are sent (send multiple images for a product). Note that the product is sent with selectable colors variations on the same sheet. This configuration is done within few seconds in the module! How do you know if the products are properly sent on Amazon? Errors are documented in English and in French by Amazon. The most common errors are documented in the FAQ module of Amazon. Other new features have been introduced since version 2.5 but the most significant and awaited new feature was this one. We will come back with the details of the other new features in another article.